← How can I test Storwize V7000 Node Canister failure? Today IBM is announcing a new member of the XIV family, which we are calling XIV Gen3. I thought I would give a brief history of how we got here before I get too carried away with details. What was Generation 1 of the XIV? 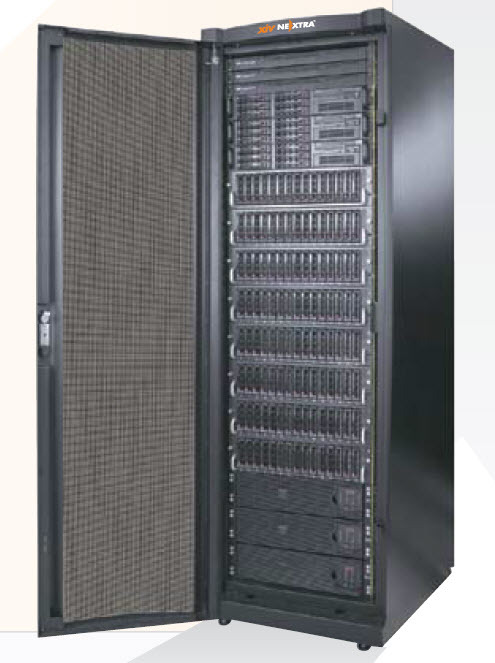 In 2002 an Israeli startup began work on a revolutionary new grid storage architecture. They devoted three years to developing this unique architecture that they called XIV. They delivered their first system to a customer in 2005. Their product was called Nextra (does it look familiar?). What was Generation 2 of the XIV? In December 2007, the IBM Corporation acquired XIV, renaming the product the IBM XIV Storage System. The first IBM version of the product was launched publically on September 8, 2008. Unofficially within IBM we refer to this as Generation 2 of the XIV. The differences between Gen1 and Gen2 were not architectural, they were mainly physical. We introduced new disks, new controllers, new interconnects, improved management, additional software functions. As anyone who has read my blog knows, I have been working on the Generation 2 XIV since the day IBM began planning to release it as an IBM product. So it is very exciting to be able to share with you that we are now releasing Generation 3 of the IBM XIV Storage System. What is Generation 3 of the XIV? Introducing Infiniband interrconnections between the modules. Upgrading the modules to add 2.4 Ghz quad core Nehalem CPUs; new DDR3 RAM and PCI Gen 2 (using 8x slots that can operate at 40 Gbps) . Upgrading the host HBAs to operate at 8 Gbps. Upgrading the disks to native SAS. A new dedicated SSD slot (per module) for future SSD upgrades. Enhancements to the GUI plus a native Mac OS version. I will be blogging about each of these changes over the coming days and weeks as we move to general availability date, so watch this space. In the meantime, why not visit the official XIV page here and check out the ITG Report linked there. I am an IT Professional who lives and works in Melbourne Australia. This blog is totally my own work. It does not represent the views of any corporation. Constructive and useful comments are very very welcome. This entry was posted in Uncategorized and tagged IBM XIV Gen3 Gen 3 Generation3. Bookmark the permalink.